Today, we’re going to take a look at some possibilities for the Oregon Duck offense, specifically the running game, this coming season. We’re at a point in the offseason where we don’t know a whole lot about what the coaching staff is planning for this offense. We’ve seen a couple scrimmages so far that have told us a little, but after the spring game this coming Saturday, we should know a bit more. We can gather a few things so far based on some brief practices and scrimmages, what the coaches have said, and coaches’ past experience. One such item is that this offense will be similar to last season, but with more variety in the passing game thanks to new OC Marcus Arroyo. We know the Ducks will utilize the Pistol a lot more, if not as base formation. Maybe most importantly, Oregon wants to be big and tough in the trenches while keeping everything else about Oregon’s traditional offensive identity. I want to take a look at an idea floating around that we could be seeing more multiple back sets this season. This idea comes from the fact that we have a committee of running backs and no clear-cut starter currently. Though not concrete, this makes for a fun discussion, as we can take a look at a few ways in which the Ducks can utilize multi-back sets from both the Pistol and Shotgun. 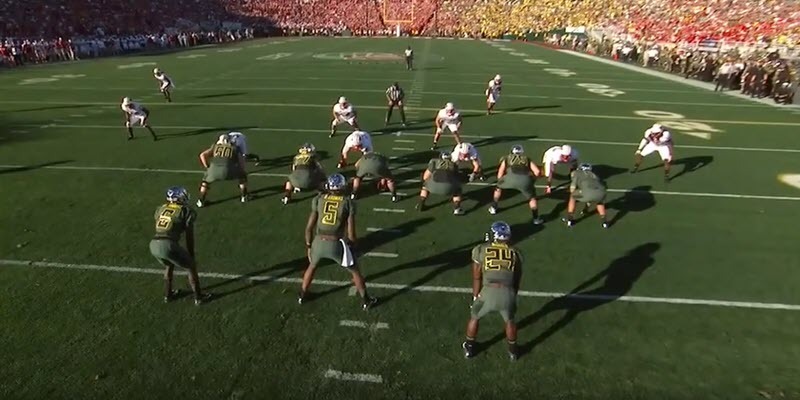 The first two back set is the obvious Split Back set Oregon has used for the better part of the last decade. This is your simple two-back Shotgun formation where a running back is aligned on each side of the quarterback. In the video above, De’Anthony Thomas has a huge touchdown run off of Triple Option/Straddled Option from the Split Back set. I’ll be using the Triple Option as a base play in the following examples, to better illustrate the different types of looks that can be installed for the same plays. The next multi-back set is the Diamond formation. For those that don’t know what that is, it’s when the QB has a RB to each side of him, just like a Split Back formation, with an additional RB directly behind him in a Pistol-like look. The formation in the video above has only one RB aligned next to the QB and one behind him. Thus, to avoid confusion between this and the other, true Diamond formation, I call this one the Half Karat. The last formation I want to take a look at is this I-Pistol that the University of New Mexico employs. Above, we see two backs lined up directly behind the QB. Oregon has shown something similar to this before. The first back in this formation can easily be a TE/FB, making for a big, tough body as the dive man on the Triple Option, or as a lead blocker in lead, iso, or “super” power plays (more than one lead blocker). The I-Pistol also allows for additional lead backs, making it an effective goal line formation. 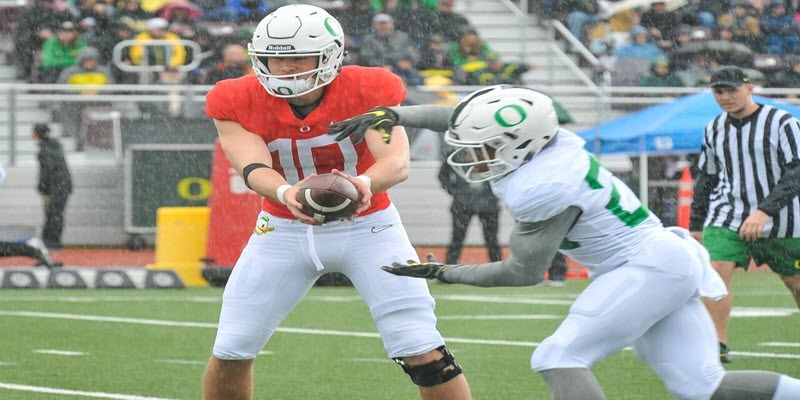 BONUS: In one of his latest articles, Charles touched on the Inverted Veer/Power Read that Oregon ran from the Split Back set during their scrimmage in Portland. This made me think of a play that I’ve only seen once, in 2011, and haven’t seen since. It’s a play that I’d like to see Oregon throw in. Above, you can see what I would call and Inverted Veer Triple Option, though there has to be a shorter name for it. Here the QB hands off and the two RBs create a pitch relationship for the speed option portion of the play. It’s really neat and creative! As this article was written strictly for discussion, and didn’t have a whole lot of teaching moments, I’d like to get your ideas in the comments below. Do you like the idea of more multi-back sets? Do you like the sets above? What two-back sets would you install? Any three-back sets? Do you have a design in your head that you haven’t seen a team run? Favorite whacky play from multi-back sets? I want to hear about them!